Do you want to get returning students excited about their new school year? 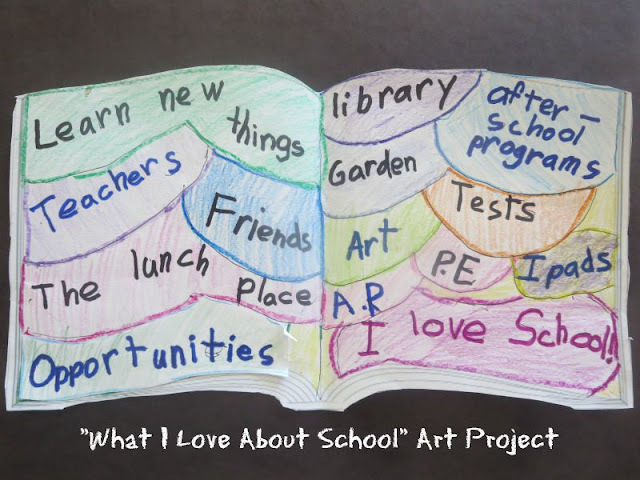 Kick a new school year off at home or in a classroom with this fun art project that focuses on all good things that school has to offer. Usually, Smarty is looking forward to a new school year, but she really enjoyed free flow of summer days and later mornings this time around. She told me that she is really not looking forward to go back to school, so I asked her jokingly if she wants to be homeschooled. She answered, “No”, and started listing her favorite things about school. This gave me an idea for the project similar to the Map of Your Heart that we did in kindergarten. This project could also be done collaboratively in the classroom with kids offering input and then creating a cooperative quilt with favorite things about school. Smarty is going to the fourth grade, and she did an entire project on her own, but it was interesting to talk to her about her favorite things about school. It was equally interesting to me what went on her list as what she chose to exclude. For example, she said that she does not like music class in school, because many kids are out of control, and then Mr. G yells at all of us. She also chose not to include recess even though during the year she often referred to it as her favorite part of the day. Unfortunately, in the very end of the year she ended up in a triangle of friends who couldn’t get along with each other, so recess became a bit stressful for her, and I am wondering how she will handle it this year. On the other hand, she added tests as her favorite part. 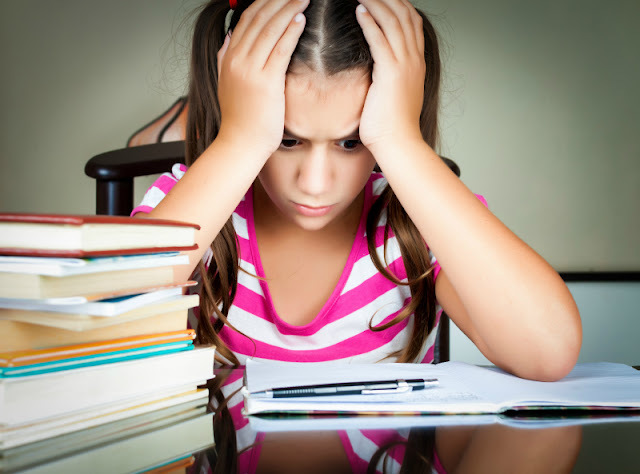 Smarty is one of those kids who look at tests as an opportunity to demonstrate knowledge and to be challenged, so she has no test anxiety and is actually looking forward to them. She also enjoys AR – Accelerated Reader program that her school uses to encourage kids to read and earn rewards. Smarty is not a person who is able to sustain her attention for long time on most art projects (clay is an exception), so we broke this project into several steps. It’s also a good modification for younger students. Cutting the project and mounting it. I planned to mount it on a paper as a collage, but Smarty thought that it will make an excellent card for her new teacher for the first day of school, so she made a “jacket” for it from a thicker paper, and decorated the cover with stickers. If you do this project with younger kids, don’t focus on correct spelling. In fact, the current level of spelling, whatever it might be, will make an entire project more authentic. But Smarty is sensitive to spelling mistakes and she was upset when she realized that she misspelled the word opportunities. She solved this problem by asking me to trace this segment of her project, cut out a new piece and glued it on top of misspelled word. Again, I would suggest not to worry about spelling unless your student specifically asks you to spell some of the words for them. Are your children excited about going back to school? FREE Back to School Noun Practice from Look! We're Learning! Love this! My girls would enjoy doing it before school starts this year. Fantastic Art project - we also do the AR programme J started last year in 1st grade and has made so much progress in the last year - he's rapidly moved onto longer and longer chapter books it's such a fabulous programme. This is such a creative and doable art project! What a fun back to school idea. This is brilliant! I love how it focuses their attention on good things coming up...that would make the transition so much easier! I'm totally doing this with our kiddos! It'd be interesting to see what my kids would come up with. I'm sure it'd be a very different on the gender split in my home. Another blogging friend did something similar-ish with her pre-teens just today. Very few people I know love tests. Glad there's no test anxiety for her! pieces to make it doable for Smarty. This is a great back to school project! What a great and fun project. It is so nice to be focusing on the positives. What a creative way to get excited about the new school year!